Reports for the incidents have not yet been released but an unusual string of four burglaries were reported Friday from 10th Ave E to north Broadway. Three of the incidents were residential break-ins including two near the 1800 block of 10th Ave E. The third residential burglary was reported Friday afternoon in the 600 block of Broadway E near Joule and the Brix. The fourth burglary is listed as a commercial break-in at an unnamed business in the 2400 block of 10th Ave E near the Roanoke Tavern. Last month, we reported on a series of burglaries east of Volunteer Park. We’ll watch for SPD’s reports on the incidents but let us know if you have any information to share about the reported crimes. 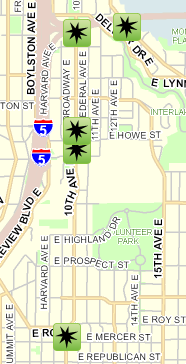 According to seattlecrime.com there was also another “burglary, occupied” on the 1900 block of 10th Ave E. This was reported on 6/9 at 2:50 pm. Is the tent city still behind the church on 10th? It seems all these burglaries have happened just after the announcement of the new 10th ave. tent city. Are these related? My car was broken into on June 22nd at 1:05am in my driveway of my home in the 1600 block of Federal Avenue East. I have poor-quality video surveillance of the thief who is a white male wearing a baseball cap. He was searching through my car for 30 minutes or so and was clever enough to disable the trunk light while he searched the contents and evade motion detector lights. My dog eventually scared him away.